Azura Stevens wants to be around for a while. “It’s a marathon. My career, I want it to be a marathon, not a sprint,” Stevens said. And it’s this singular focus on a long, successful career that helped Stevens get to this point. Earlier this year the Wings power forward – just like her favorite NBA player Kevin Durant – found herself faced with a life-altering decision to make. UCONN had been eliminated by Notre Dame in the NCAA semifinals – their only loss in a 36-win season. Stevens had one year of eligibility left and – despite the whispers and opinions of others - decided to give it up and enter the WNBA Draft. The 6-foot-6 junior, who played just one year at UConn after transferring from Duke, was selected No. 6 by the Wings and is well on her way to making her name in the league, knowing without a doubt she made the right decision. “I’m 100 percent glad I made this decision because I think it’s a decision I made for me,” Stevens said recently after a Wings practice. “That’s just a sign, I guess, of my personal growth; listening to what it is I wanted to do. But it hasn’t been all peaches and cream. “It’s been difficult, I’m not going to lie. I think just adjusting to the pace of play, the physicality, those are all things I knew going in but it’s different when you’re actually experiencing it,” Steven said. “That’s definitely been an adjustment. Stevens made her grand debut for the Wings in the team’s first preseason game in May, leading the team to a 76-69 victory over the New York Liberty with 19 points and nine rebounds. She played well throughout the preseason and has since settled into the fast pace of the WNBA season. She has played in all eight games this season and in just over 18 minutes of action off the bench is averaging 5.6 points and 3.8 rebounds per game. She’s a 75-percent free throw shooter and shoots 35 percent from the field. Stevens’ overall basketball IQ is great. 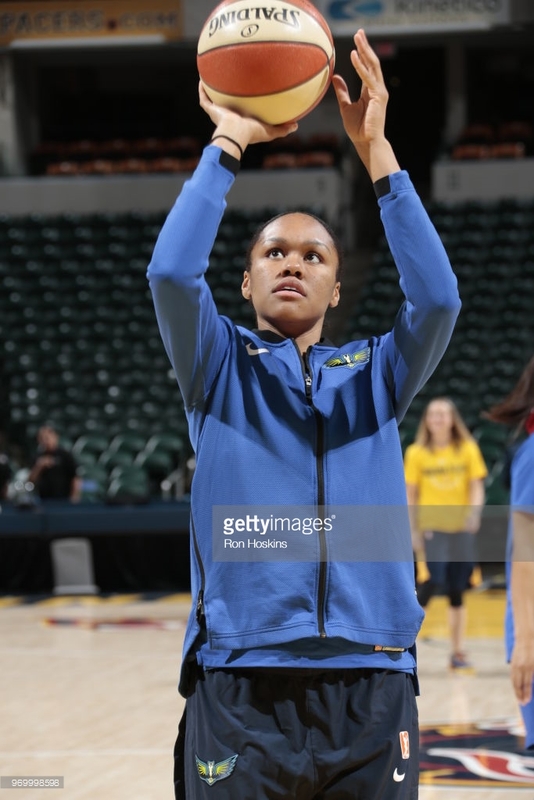 Always wearing a smile and clearly the life of the Wings’ party along with teammate Kayla Thornton, Stevens talked with WNBAInsidr about going from college to the pros, remaining ready on the bench and how she relaxes. On coming off the bench: “You have to know your role really well. I have recent experience coming off the bench at UCONN. You just find a way to make an impact with whatever time you get. My thing now is being aggressive. As a rookie I’ve been told by a lot of people and I’ve experienced it myself, everything is going fast and you’re like I don’t’ want to make any mistakes. But I’m trying to train myself to just be aggressive, to just come out and be aggressive. You know, If I’m doing something wrong, at least I’m doing it aggressively. We can work with that.